When it comes to dependable tooth replacement options, dental implants are, without a doubt, the most impressive option available today. 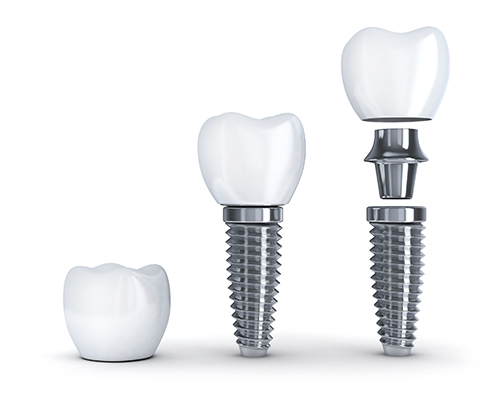 Where a lot of tooth replacement options tend to fall short, dental implants excel. What are dental implants? They are a permanent tooth replacement option, made of titanium and surgically placed into the bone of your jaw. By placing the implant into the bone of your jaw, bone loss is prevented. In fact, bone growth is encouraged, which bodes quite well for the rest of your natural, healthy teeth. They offer our patients a permanent tooth replacement option that looks and feels just like their natural tooth and can be taken care of in the same way as a natural tooth. This avoids extra steps in oral maintenance that removable prosthetics require. Eating food with teeth missing can be painful, and in the cases of some foods, impossible. Further, tooth loss can be embarrassing and lead to a loss of self-esteem. It’s easy to stop smiling so much when you know people are just looking at the teeth that you are missing. The most compelling reason to replace teeth with implants is to encourage a healthy mouth and prevent further tooth loss. To prepare the site we will make a small incision in the gums in order to expose the jaw bone. Before even preparing the site we will familiarize ourselves with the condition of your jaw structure (using X-ray technology) to determine whether you have enough healthy bone to support dental implants. If there isn’t enough healthy bone to support a dental implant, we will need to perform a bone graft. Once the bone has been prepared we will place the implant and suture the gum tissue back in place. After roughly a week we will remove the sutures and allow the implant to heal. Healing time can last from 3 to 12 months. During this time the post will be accepted by the bone in your jaw through a process known as osseointegration. Once the implant has been allowed to heal you will return for your final appointment. During this appointment we will place the last two pieces of the implant – the abutment and the crown. The abutment is screwed into the implant and secured in place. It simply provides a surface for us to attach the crown to. The crown is specially designed to match your bite precisely, as well as looking and feeling just like your natural teeth. In cases of multi-tooth or full arch replacement we will have either a bridge or a permanent denture created for your mouth.